* Meet and greet with local designers and get a sneak peak at their creative process! * Attendance is limited, so don’t wait to RSVP! 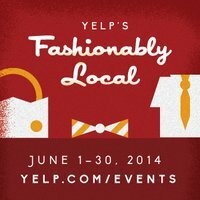 YELP’S FASHIONABLY LOCAL: Yelp’s Getting Hitched or Ready to Ditch! DETAILS: An event for brides and friends alike! We’ll be talking bridal fashion with Erin, Glitter & Grit owner and getting wedding photography tips from Veronica Varos. Have ugly bridesmaid dresses? Jen Rocket will be talking up-cycle, so bring ‘em in! DETAILS: Bring your gently used or barely worn clothes, shoes, and accessories and we’ll swap ‘em out for something brand new to you! Anything not taken will be donated to a Salvation Army. Plus, sip and sample from Carnegie Coffee Company. DETAILS: Visit with Emily, owner of Mid-Atlantic Mercantile as she talks about the importance of obtaining made in the US materials. Plus, learn about the latest in men’s and women’s fashions according to her stylish aesthetic. Also, sample some delicious Family Farms Creamery ice cream! DETAILS: Find out what colors work for your skin-tone with local House of Colour rep Julie and hear from Cara, Jupe owner, who will be talking about the latest spring and summer trends. Tasty bites by Leona’s Ice Cream Sandwiches. DETAILS: Visit Moop’s studio, see how their bags are created, stay for the food trucks and brews! DETAILS: Learn how to shop for your own vintage treasures from the experts! Kate, Highway Robbery owner, and Bess Dunlevy, Pittsburgh Vintage Mixer creator will be on hand to give you tips and tricks of the trade. DETAILS: Meet Kelly Lane, local designer who creates bold compositions of color, print, and line to form flattering silhouettes. All garments are carefully crafted from eco-friendly fabrics. Learn about her process from concept to design to actual product!